On the 6th of April 1917, the United States under President Wilson declared war on Germany. Now, America had to mobilize for war as fast and effectively as possible. The Navy Nurse Corps numbered 160 members at that time. A few days later, the Secretary of the Navy authorized the Surgeon General to appoint Reserve Nurses as permitted by the 1908 Act that established the Navy Nurse Corps. Soon, the first nurses were enrolled in the Naval Reserve Force (USNRF). By July, 155 USNRF nurses were already on active duty. Additional reserve nurses were provided by the American Red Cross that acted as reserve pool for the Army and Navy in emergency. Between 6 April 1917 and 3 March 1921 (the official end of American participation in hostilities and war-related occupation duty) a total of 1,835 nurses served in the Navy Nurse Corps. 327 were on duty outside the USA. Without the needs of the major battlefields after the armistice, the personnel strength of the NNC started to drop in 1919. 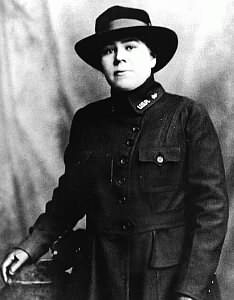 The photograph on the right side, taken 1918, presents Navy Nurse Anna Keisur in her duty uniform. The initials on her uniform collar read "USR (for "United States Reserve). She was one of the many reserve nurses that did active duty during WWI. ..
. Besides caring for the sick, their most important jobs were to work as instructors and supervisors of hospital corpsmen who had to be prepared for their nurse duties in combat areas. The number of Naval Hospitals within the continental United States to whom Navy Nurses were appointed was increased. In 1918 there were 25 hospitals, as well as several smaller facilities. 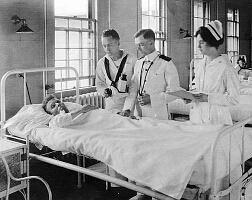 In comparison, Navy Nurses served at 6 Naval hospitals inside the USA, at the beginning of 1911. This WWI photograph shows hospital corpsmen cleaning and dressing wounds supervised by a Navy Nurse in the U.S. Naval Hospital, New Orleans (Louisiana). This picture from 1919 taken at the U.S. 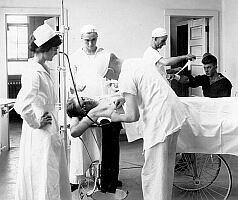 Naval Hospital, Chelsea (Massachusetts) shows a Navy surgeon, a Navy Nurse and a hospital corpsman examining a patient. Nurses aboard the transport ship USS Leviathan during a World War I Atlantic crossing. The nurses are dressed in rubber survival gear. .. In September 1917, the first nurses were sent overseas to Europe. In French Brest they helped to set up the first Naval Base Hospital under extremely difficult conditions. The medical personnel had to deal with an old low standard building and missing equipment. The incoming patients often were badly injured. Horrible suffering victims of mustard gas attacks were treated. The situation for the nurses developed dangerous when the hospital faced enemy attacks like night raids as well as some day raids. In 1918-1919, the influenza pandemic added additional suffering and thousands of deaths to the war destruction. Actually, half of the American soldiers who died in Europe fell to the influenza virus and not to the enemy. The influenza pandemic circled the globe and infected about one-quarter of the US and one-fifth of the world population. An estimated 675,000 Americans died of influenza. This most devasting epidemic taxed all medical staff to the limit, on the battlefields as well as on the homefront. Next to France, Navy Nurses were stationed in Scotland and Ireland. They were assigned to all of the 5 European Base Hospitals that the Navy set up during the war. Almost 300 nurses served in Europe during WWI. Some Navy Nurses worked on overseas stations far away from the European war zone. First of all, they continued their work at the already established stations in the Pacific area: Canacao, Guam and Tutuila. In 1917, Navy Nurses started their duty at St. Thomas and St. Croix on the Virgin Islands located in the Caribbean. In 1918, Port au Prince (Haiti) was added. Again, the nurses helped to build up training schools for native women to teach them nurse tasks. In April 1919, Navy Nurses received their first order for duty at the Naval Hospital in Yokohama, Japan. .. After the armistice, in December 1918, Navy Nurses were assigned to medical duty aboard Navy ships to accompany American troops back home from the war in Europe. A year later, nurses were also aboard transport ships when prisoners and internees were returned to Europe. 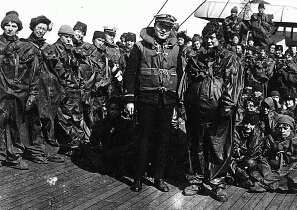 The picture on the left side shows two Navy Nurses aboard the transport ship USS George Washington in December 1918. The Navy Nurse Corps clearly proved its value for the Navy during this war. 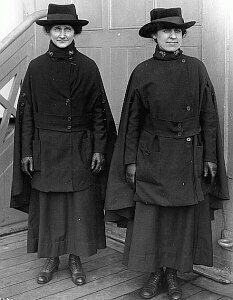 A couple of Navy Nurses received awards and citations as acknowledgement of their brave performance during World War I.
. 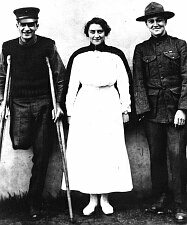 The WWI period photograph shows a Navy Nurse with two U.S. Marines. The solider on the left has lost his right leg, while the one on the right side has lost his right arm. Caring for the war wounds of the returning soldiers was an important job for nurses after the end of war. 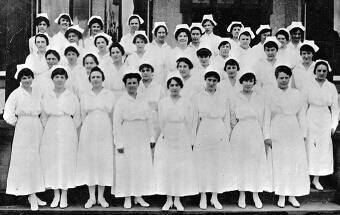 During the official American war period between April 1917 and March 1921, 36 Nurses died while in service. 16 were Reserve Nurses, 15 USNRF Nurses and 5 Regular Navy Nurses. More than half of the deaths were caused by Influenza. No nurse died as result of enemy action. Navy Nurses during WWII .